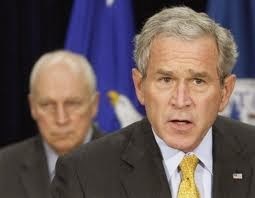 New York Times Editorial Board Calls For Prosecution Of Bush, Cheney And Torturers ! "Since the day President Obama took office, he has failed to bring to justice anyone responsible for the torture of terrorism suspects — an official government program conceived and carried out in the years after the attacks of Sept. 11, 2001. Mr. Obama has said multiple times that "we need to look forward as opposed to looking backwards," as though the two were incompatible. They are not. The nation cannot move forward in any meaningful way without coming to terms, legally and morally, with the abhorrent acts that were authorized, given a false patina of legality, and committed by American men and women from the highest levels of government on down. Americans have known about many of these acts for years, but the 524-page executive summary of the Senate Intelligence Committee’s report erases any lingering doubt about their depravity and illegality: In addition to new revelations of sadistic tactics like "rectal feeding," scores of detainees were waterboarded, hung by their wrists, confined in coffins, sleep-deprived, threatened with death or brutally beaten. In November 2002, one detainee who was chained to a concrete floor died of "suspected hypothermia." These are, simply, crimes. They are prohibited by federal law, which defines torture as the intentional infliction of "severe physical or mental pain or suffering." They are also banned by the Convention Against Torture, the international treaty that the United States ratified in 1994 and that requires prosecution of any acts of torture. In July 2002, C.I.A. lawyers told the Justice Department that the agency needed to use "more aggressive methods" of interrogation that would "otherwise be prohibited by the torture statute." They asked the department to promise not to prosecute those who used these methods. When the department refused, they shopped around for the answer they wanted. They got it from the ideologically driven lawyers in the Office of Legal Counsel, who wrote memos fabricating a legal foundation for the methods. Government officials now rely on the memos as proof that they sought and received legal clearance for their actions. But the report changes the game: We now know that this reliance was not made in good faith. The American Civil Liberties Union and Human Rights Watch are to give Attorney General Eric Holder Jr. a letter Monday calling for appointment of a special prosecutor to investigate what appears increasingly to be "a vast criminal conspiracy, under color of law, to commit torture and other serious crimes." One would expect Republicans who have gone hoarse braying about Mr. Obama’s executive overreach to be the first to demand accountability, but with one notable exception, Senator John McCain, they have either fallen silent or actively defended the indefensible. They cannot even point to any results: Contrary to repeated claims by the C.I.A., the report concluded that "at no time" did any of these techniques yield intelligence that averted a terror attack. And at least 26 detainees were later determined to have been "wrongfully held."